BAKERSFIELD, Calif. - Dec. 14, 2018 - PRLog -- Dr. Michael Thurman, owner of Thurman Orthodontics in Bakersfield, recently announced a new holiday initiative with the hope of spreading smiles and warming hearts in the community. In the month of December, the team at Thurman Orthodontics is hosting a Coat Drive. 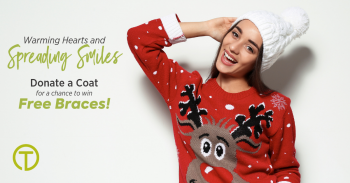 Any new patient that comes in for a free braces or Invisalign consultation in December and donates a coat will be entered to win free orthodontic treatment at the practice. "The holiday season is about giving back which has been an important pillar of our practice philosophy since our doors opened in 2010. This is just another way we can help spread holiday cheer in our community," explains Kristin Blundell, Chief Financial Officer of Thurman Orthodontics. Thurman Orthodontics has partnered with several organizations this year in an effort to provide much needed support. The Bakersfield Burrito Project and the Bakersfield Wounded Warriors organizations have received an abundance of support from the practice this year. The team has also supported smaller organizations and events in 2018 and will continue to do so in the new year. "The community support for us has been incredible through the years. We wouldn't be here without it. Giving back and supporting other organizations doing such amazing work is really a no-brainer for us. We're excited to give the gift of orthodontic treatment in January," says Dr. Thurman. To have a chance to win free braces at Thurman Orthodontics, new patients are encouraged to call (661) 395-0698 or visit www.thurmanorthodontics.com to request a free braces or Invisalign consultation. Thurman Orthodontics offers quality orthodontic care for children, teens and adults at an affordable cost. The practice strives to exceed expectations in every way possible by providing the best service in a fun and rewarding office atmosphere. Thurman Orthodontics is committed to the community, continuously searching for ways to give back. For more information about the practice and community outreach programs, visit www.thurmanorthodontics.com (http://www.thurmanorthodontics.com/).